42:2.1 It is indeed difficult to find suitable words in the English language whereby to designate and wherewith to describe the various levels of force and energy—physical, mindal, or spiritual. These narratives cannot altogether follow your accepted definitions of force, energy, and power. There is such paucity of language that we must use these terms in multiple meanings. In this paper, for example, the word energy is used to denote all phases and forms of phenomenal motion, action, and potential, while force is applied to the pregravity, and power to the postgravity, stages of energy. 42:2.3 1. Space potency. This is the unquestioned free space presence of the Unqualified Absolute. The extension of this concept connotes the universe force-space potential inherent in the functional totality of the Unqualified Absolute, while the intension of this concept implies the totality of cosmic reality—universes—which emanated eternitywise from the never-beginning, never-ending, never-moving, never-changing Isle of Paradise. 42:2.4 The phenomena indigenous to the nether side of Paradise probably embrace three zones of absolute force presence and performance: the fulcral zone of the Unqualified Absolute, the zone of the Isle of Paradise itself, and the intervening zone of certain unidentified equalizing and compensating agencies or functions. These triconcentric zones are the centrum of the Paradise cycle of cosmic reality. 42:2.5 Space potency is a prereality; it is the domain of the Unqualified Absolute and is responsive only to the personal grasp of the Universal Father, notwithstanding that it is seemingly modifiable by the presence of the Primary Master Force Organizers. 42:2.6 On Uversa, space potency is spoken of as ABSOLUTA. 42:2.8 Passive and potential force becomes active and primordial in response to the resistance afforded by the space presence of the Primary Eventuated Master Force Organizers. Force is now emerging from the exclusive domain of the Unqualified Absolute into the realms of multiple response—response to certain primal motions initiated by the God of Action and thereupon to certain compensating motions emanating from the Universal Absolute. Primordial force is seemingly reactive to transcendental causation in proportion to absoluteness. 42:2.9 Primordial force is sometimes spoken of as pure energy; on Uversa we refer to it as SEGREGATA. 42:2.13 We are quite uncertain regarding the exact causes of the early stages of force evolution, but we recognize the intelligent action of the Ultimate in both levels of emergent-energy manifestation. Puissant and gravity energies, when regarded collectively, are spoken of on Uversa as ULTIMATA. 42:2.14 4. Universe power. Space-force has been changed into space-energy and thence into the energy of gravity control. Thus has physical energy been ripened to that point where it can be directed into channels of power and made to serve the manifold purposes of the universe Creators. This work is carried on by the versatile directors, centers, and controllers of physical energy in the grand universe—the organized and inhabited creations. These Universe Power Directors assume the more or less complete control of twenty-one of the thirty phases of energy constituting the present energy system of the seven superuniverses. This domain of power-energy-matter is the realm of the intelligent activities of the Sevenfold, functioning under the time-space overcontrol of the Supreme. 42:2.15 On Uversa we refer to the realm of universe power as GRAVITA. 42:2.16 5. Havona energy. In concept this narrative has been moving Paradiseward as transmuting space-force has been followed, level by level, to the working level of the energy-power of the universes of time and space. Continuing Paradiseward, there is next encountered a pre-existent phase of energy which is characteristic of the central universe. Here the evolutionary cycle seems to turn back upon itself; energy-power now seems to begin to swing back towards force, but force of a nature very unlike that of space potency and primordial force. Havona energy systems are not dual; they are triune. This is the existential energy domain of the Conjoint Actor, functioning in behalf of the Paradise Trinity. 42:2.17 On Uversa these energies of Havona are known as TRIATA. 42:2.18 6. Transcendental energy. This energy system operates on and from the upper level of Paradise and only in connection with the absonite peoples. On Uversa it is denominated TRANOSTA. 42:2.19 7. Monota. Energy is close of kin to divinity when it is Paradise energy. We incline to the belief that monota is the living, nonspirit energy of Paradise—an eternity counterpart of the living, spirit energy of the Original Son—hence the nonspiritual energy system of the Universal Father. 42:2.20 We cannot differentiate the nature of Paradise spirit and Paradise monota; they are apparently alike. They have different names, but you can hardly be told very much about a reality whose spiritual and whose nonspiritual manifestations are distinguishable only by name. 42:2.21 We know that finite creatures can attain the worship experience of the Universal Father through the ministry of God the Sevenfold and the Thought Adjusters, but we doubt that any subabsolute personality, even power directors, can comprehend the energy infinity of the First Great Source and Center. One thing is certain: If the power directors are conversant with the technique of the metamorphosis of space-force, they do not reveal the secret to the rest of us. It is my opinion that they do not fully comprehend the function of the force organizers. 42:2.22 These power directors themselves are energy catalyzers; that is, they cause energy to segment, organize, or assemble in unit formation by their presence. And all this implies that there must be something inherent in energy which causes it thus to function in the presence of these power entities. The Nebadon Melchizedeks long since denominated the phenomenon of the transmutation of cosmic force into universe power as one of the seven “infinities of divinity.” And that is as far as you will advance on this point during your local universe ascension. 42:2.23 Notwithstanding our inability fully to comprehend the origin, nature, and transmutations of cosmic force, we are fully conversant with all phases of emergent-energy behavior from the times of its direct and unmistakable response to the action of Paradise gravity—about the time of the beginning of the function of the superuniverse power directors. 42:3.1 Matter in all universes, excepting in the central universe, is identical. Matter in its physical properties depends on the revolutionary rates of its component members, the number and size of the revolving members, their distance from the nuclear body or the space content of matter, as well as on the presence of certain forces as yet undiscovered on Urantia. 42:3.13 The foregoing classification of matter pertains to its organization rather than to the forms of its appearance to created beings. Neither does it take into account the pre-emergent stages of energy nor the eternal materializations on Paradise and in the central universe. 42:4.14 The quantity of energy taken in or given out when electronic or other positions are shifted is always a “quantum” or some multiple thereof, but the vibratory or wavelike behavior of such units of energy is wholly determined by the dimensions of the material structures concerned. Such wavelike energy ripples are 860 times the diameters of the ultimatons, electrons, atoms, or other units thus performing. The never-ending confusion attending the observation of the wave mechanics of quantum behavior is due to the superimposition of energy waves: Two crests can combine to make a double-height crest, while a crest and a trough may combine, thus producing mutual cancellation. 42:5.10 8. The white light—the whole visible light of the suns. 42:5.11 9. Infrared rays—the slowing down of electronic activity still nearer the stage of appreciable heat. 42:5.12 10. Hertzian waves—those energies utilized on Urantia for broadcasting. 42:6.8 If the mass of matter should be magnified until that of an electron equaled one tenth of an ounce, then were size to be proportionately magnified, the volume of such an electron would become as large as that of the earth. If the volume of a proton—eighteen hundred times as heavy as an electron—should be magnified to the size of the head of a pin, then, in comparison, a pin’s head would attain a diameter equal to that of the earth’s orbit around the sun. 42:7.1 The formation of all matter is on the order of the solar system. There is at the center of every minute universe of energy a relatively stable, comparatively stationary, nuclear portion of material existence. This central unit is endowed with a threefold possibility of manifestation. Surrounding this energy center there whirl, in endless profusion but in fluctuating circuits, the energy units which are faintly comparable to the planets encircling the sun of some starry group like your own solar system. 42:7.2 Within the atom the electrons revolve about the central proton with about the same comparative room the planets have as they revolve about the sun in the space of the solar system. There is the same relative distance, in comparison with actual size, between the atomic nucleus and the inner electronic circuit as exists between the inner planet, Mercury, and your sun. 42:7.3 The electronic axial revolutions and their orbital velocities about the atomic nucleus are both beyond the human imagination, not to mention the velocities of their component ultimatons. The positive particles of radium fly off into space at the rate of ten thousand miles a second, while the negative particles attain a velocity approximating that of light. 42:7.4 The local universes are of decimal construction. There are just one hundred distinguishable atomic materializations of space-energy in a dual universe; that is the maximum possible organization of matter in Nebadon. These one hundred forms of matter consist of a regular series in which from one to one hundred electrons revolve around a central and relatively compact nucleus. It is this orderly and dependable association of various energies that constitutes matter. 42:7.5 Not every world will show one hundred recognizable elements at the surface, but they are somewhere present, have been present, or are in process of evolution. Conditions surrounding the origin and subsequent evolution of a planet determine how many of the one hundred atomic types will be observable. The heavier atoms are not found on the surface of many worlds. Even on Urantia the known heavier elements manifest a tendency to fly to pieces, as is illustrated by radium behavior. 42:7.6 Stability of the atom depends on the number of electrically inactive neutrons in the central body. Chemical behavior is wholly dependent on the activity of the freely revolving electrons. 42:7.8 While atoms may contain from one to one hundred orbital electrons, only the outer ten electrons of the larger atoms revolve about the central nucleus as distinct and discrete bodies, intactly and compactly swinging around on precise and definite orbits. The thirty electrons nearest the center are difficult of observation or detection as separate and organized bodies. This same comparative ratio of electronic behavior in relation to nuclear proximity obtains in all atoms regardless of the number of electrons embraced. The nearer the nucleus, the less there is of electronic individuality. The wavelike energy extension of an electron may so spread out as to occupy the whole of the lesser atomic orbits; especially is this true of the electrons nearest the atomic nucleus. 42:7.9 The thirty innermost orbital electrons have individuality, but their energy systems tend to intermingle, extending from electron to electron and well-nigh from orbit to orbit. The next thirty electrons constitute the second family, or energy zone, and are of advancing individuality, bodies of matter exerting a more complete control over their attendant energy systems. The next thirty electrons, the third energy zone, are still more individualized and circulate in more distinct and definite orbits. The last ten electrons, present in only the ten heaviest elements, are possessed of the dignity of independence and are, therefore, able to escape more or less freely from the control of the mother nucleus. With a minimum variation in temperature and pressure, the members of this fourth and outermost group of electrons will escape from the grasp of the central nucleus, as is illustrated by the spontaneous disruption of uranium and kindred elements. 42:10.6The cosmic mind. This is the sevenfold diversified mind of time and space, one phase of which is ministered by each of the Seven Master Spirits to one of the seven superuniverses. The cosmic mind encompasses all finite-mind levels and co-ordinates experientially with the evolutionary-deity levels of the Supreme Mind and transcendentally with the existential levels of absolute mind—the direct circuits of the Conjoint Actor. 42:12.9 Mind is always creative. The mind endowment of an individual animal, mortal, morontian, spirit ascender, or finality attainer is always competent to produce a suitable and serviceable body for the living creature identity. But the presence phenomenon of a personality or the pattern of an identity, as such, is not a manifestation of energy, either physical, mindal, or spiritual. The personality form is the pattern aspect of a living being; it connotes the arrangement of energies, and this, plus life and motion, is the mechanism of creature existence. 42:12.10 Even spirit beings have form, and these spirit forms (patterns) are real. Even the highest type of spirit personalities have forms—personality presences in every sense analogous to Urantia mortal bodies. Nearly all beings encountered in the seven superuniverses are possessed of forms. But there are a few exceptions to this general rule: Thought Adjusters appear to be without form until after fusion with the surviving souls of their mortal associates. Solitary Messengers, Inspired Trinity Spirits, Personal Aids of the Infinite Spirit, Gravity Messengers, Transcendental Recorders, and certain others are also without discoverable form. But these are typical of the exceptional few; the great majority have bona fide personality forms, forms which are individually characteristic, and which are recognizable and personally distinguishable. 42:12.11 The liaison of the cosmic mind and the ministry of the adjutant mind-spirits evolve a suitable physical tabernacle for the evolving human being. Likewise does the morontia mind individualize the morontia form for all mortal survivors. As the mortal body is personal and characteristic for every human being, so will the morontia form be highly individual and adequately characteristic of the creative mind which dominates it. No two morontia forms are any more alike than any two human bodies. The Morontia Power Supervisors sponsor, and the attending seraphim provide, the undifferentiated morontia material wherewith the morontia life can begin to work. And after the morontia life it will be found that spirit forms are equally diverse, personal, and characteristic of their respective spirit-mind indwellers. 42:12.12 On a material world you think of a body as having a spirit, but we regard the spirit as having a body. The material eyes are truly the windows of the spirit-born soul. The spirit is the architect, the mind is the builder, the body is the material building. 42:12.13 Physical, spiritual, and mindal energies, as such and in their pure states, do not fully interact as actuals of the phenomenal universes. On Paradise the three energies are co-ordinate, in Havona co-ordinated, while in the universe levels of finite activities there must be encountered all ranges of material, mindal, and spiritual dominance. 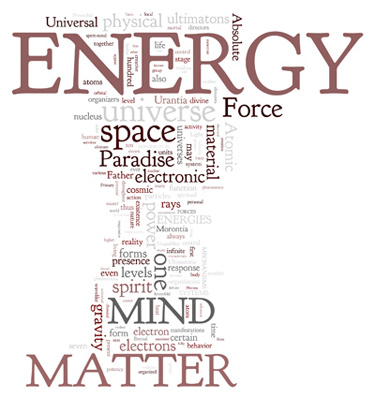 In nonpersonal situations of time and space, physical energy seems to predominate, but it also appears that the more nearly spirit-mind function approaches divinity of purpose and supremacy of action, the more nearly does the spirit phase become dominant; that on the ultimate level spirit-mind may become all but completely dominant. On the absolute level spirit certainly is dominant. And from there on out through the realms of time and space, wherever a divine spirit reality is present, whenever a real spirit-mind is functioning, there always tends to be produced a material or physical counterpart of that spirit reality. 42:12.14 The spirit is the creative reality; the physical counterpart is the time-space reflection of the spirit reality, the physical repercussion of the creative action of spirit-mind. 42:12.15 Mind universally dominates matter, even as it is in turn responsive to the ultimate overcontrol of spirit. And with mortal man, only that mind which freely submits itself to the spirit direction can hope to survive the mortal time-space existence as an immortal child of the eternal spirit world of the Supreme, the Ultimate, and the Absolute: the Infinite.